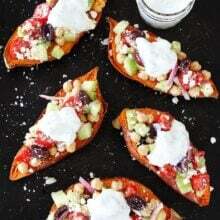 Greek Stuffed Sweet Potatoes-baked sweet potatoes topped with chickpeas, tomatoes, cucumber, kalamata olives, red onion, feta cheese, and tzatziki sauce. These loaded sweet potatoes make an easy, healthy, and delicious meal! 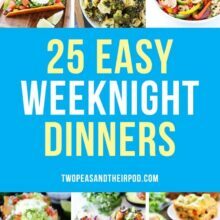 Are you looking for a super easy, super delicious, AND healthy meal? Well, I’ve got you covered today because these Greek Stuffed Sweet Potatoes are all three! And they are the perfect meal for today because it is meatless Monday and the start of a new week. I always like to start the week with something healthy, to balance out all of the weekend eats and to get me going. I need all of the help I can get on Monday. Sweet potatoes are hands down one of my all-time favorite foods. I can’t live without them. I love them roasted, in chili, in salads, in grilled cheese, in enchiladas, and they even make killer nachos. They also make an amazing base for Greek salad. 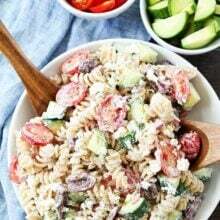 Greek salad is another one of my loves, so combine the two and you’ve pretty much got my favorite meal ever. 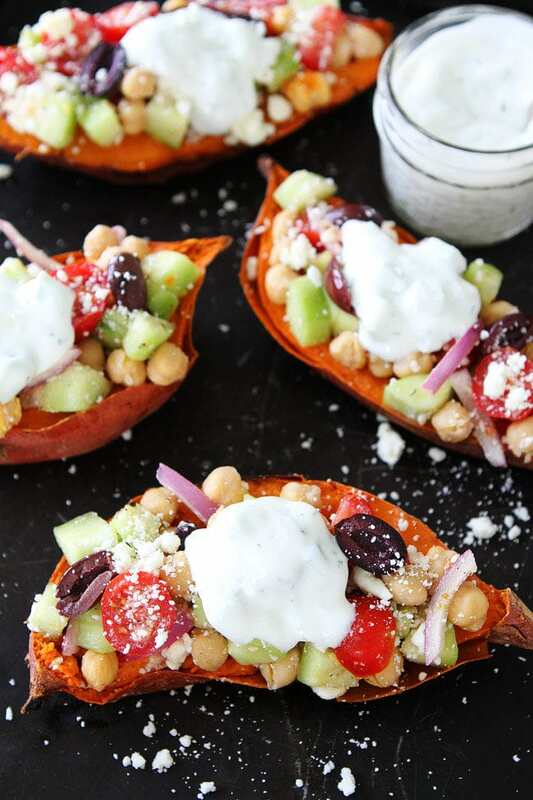 These Greek Stuffed Sweet Potatoes are EVERYTHING! I bake the sweet potatoes in the oven and then top them with a simple Greek salad and tzatziki sauce. Sooooo good! Buy sweet potatoes that are the same size so they will take the same amount of time to cook. You can bake the sweet potatoes in advance. Reheat in the microwave before serving. You can also cook the sweet potatoes in the microwave if you are in a time crunch. You can also make the tzatziki sauce in advance. I add a dollop right before serving and it really makes the sweet potatoes extra tasty. 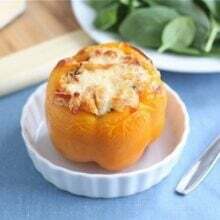 These easy stuffed sweet potatoes make a great lunch or dinner. 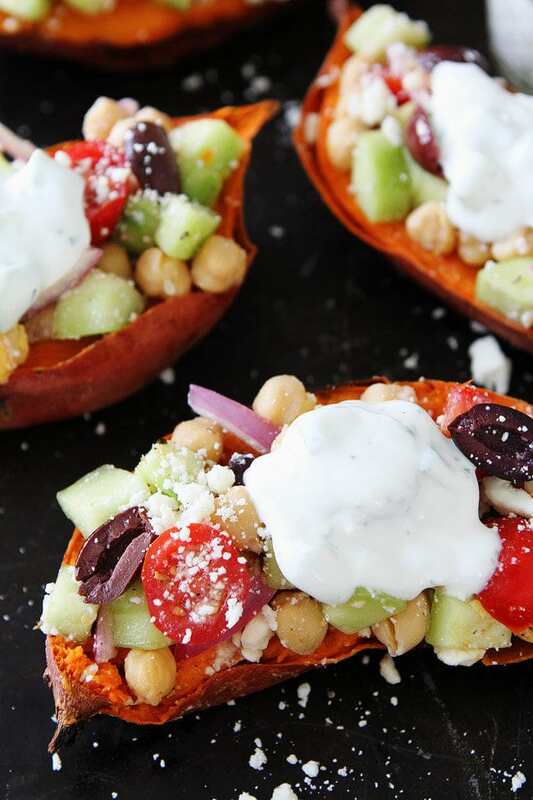 Start your week with Greek Stuffed Sweet Potatoes! They are guaranteed to make your week a good one! 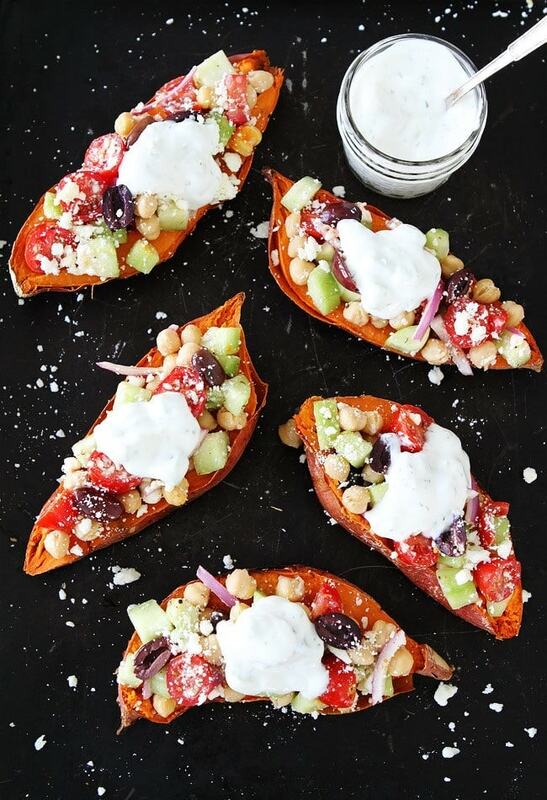 These loaded Greek sweet potatoes make an easy, healthy, and delicious meal! Preheat the oven to 400 degrees F. Line a baking sheet with parchment paper or aluminum foil. Prick each sweet potato a couple of times with a fork. Place the sweet potatoes on the baking sheet and bake until soft, about 45-50 minutes. While the sweet potatoes are baking, make the Greek filling. In a medium bowl, combine the chickpeas, tomatoes, cucumber, olives, red onion, and feta. Add the olive oil, lemon juice, red wine vinegar, and dried oregano. Stir and season with salt and black pepper, to taste. When the sweet potatoes are soft and done baking, let them cool until you are able to touch them. Cut the sweet potatoes in half with a sharp knife. Place sweet potatoes on a plate or in a bowl. To make room for the filling, smash down the sweet potatoes with a fork. Top each sweet potato half evenly with the Greek filling. Add a dollop of Tzatziki sauce. Serve immediately. 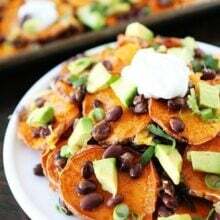 Such a great way to enjoy sweet potatoes while making a fuller meal! I absolutely LOVE these! perfect flavor combo! This is a super cool idea! Super easy, super delicious, and super healthy!